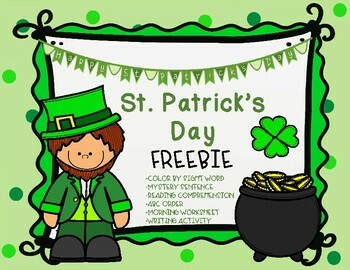 This packet is my St. Patrick's Day freebie! This packet includes fun and engaging St. Patrick's Day activities for your students. Use them as substitute packets, literacy centers, or fun homework assignments. Please consider following my store for more freebies and more quality products in the future. If you found this packet helpful please consider leaving a review! If you liked this packet please check out these other St. Patrick's Day products below! Also, find me on Instagram, Pinterest and Facebook! !